Looking for a quick and easy way to lossessly convert your Blu-rays to MKV files for Popcorn Hour player? In this article, I will provide the best solution to get the job done very well. Popcorn Hour line(A-400, A-200, C-300, etc), groundbreaking digital home entertainment devices is opening up a new era of unlimited streaming media possibilities. If you own a Popcorn Hour media player and want to play commercial Blu-ray discs on Popcorn Hour, you may got into trouble with these Blu-rays. Would you like streaming to a Popcorn Hour in your living room? But don’t know how to? just hold on reading. In this page, we will show you how to convert Blu-ray to lossless MKV as Popcorn Hour friendly format. With the right software, hardware, and understanding of the issues, you can free video from a Blu-ray movie disc to be used any way you choose. Video containers like MKV, MOV H.264, AVI and MPEG transport streams and VOBs are supported by Popcorn Hour. So, what we need to do to make the Popcorn Hour play Blu-ray movies is to convert Blu-ray to format like MKV(see why MKV), MOV or so. 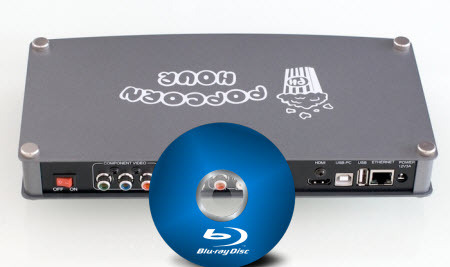 Here is guide about how to convert Blu-ray to Popcorn Hour video, check it up. A Windows PC running Pavtube ByteCopy, with accessible Blu-ray Disc drive. I’m just starting to look at ripping my Blu-ray collection to Popcorn Hour and I don’t want to compress the BD contents for Popcorn Hour in a lossy way. So Pavtube ByteCopy provides me a backup Blu-ray to lossless MKV preserving all the multiple audio and subtitle tracks as well as chapter markers. Also, I can convert Blu-ray movie on Android/Apple/Windows Device with it. You are free to try free trial version (Pavtube ByteCopy for Mac is for Mac users). Now let me show you how to backup Blu-ray to lossless MKV for Popcorn Hour in 3 steps. Run Pavtube ByteCopy, and click “Load Disc” button to import movie files from copy-protected Blu-ray Disc. Step 2. Choose Lossless MKV with chapter markers. Under “Format” menu, there are lots of video formats. 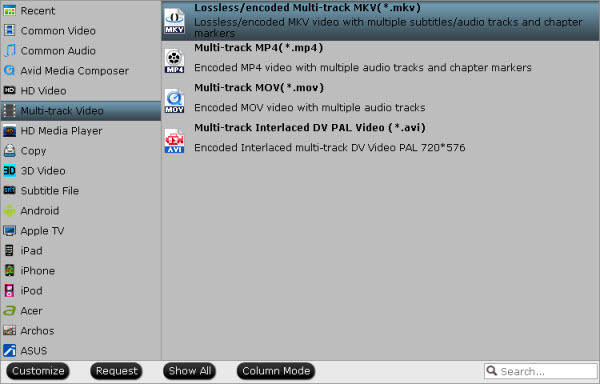 Go to find “Multi-track Video” option and choose “Lossless/encoded multi-track MKV (* mkv)” because it will contain chapter markers in output MKV. a. If you want to convert Blu-ray to other video formats or portable devices, just choose the video format you need or select portable devices in the dropdown list. b. Before conversion, you can choose output audio tracks and subtitles to keep. Simply tick off the audio and subtitles you don’t want. Click big “Convert” button to start conversion. It won’t take much time for conversion and then you will get lossless MKV once completed. Hit “Open” button you will go to location of generated files. Learn more details about how to rip Blu-ray disc and keep chapter markers and then go to fully enjoy your favorite Blu-ray whenever you wanna. Have Fun!